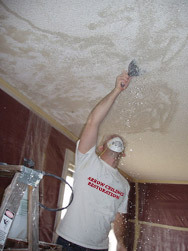 Arrow Ceiling Restoration has been providing professional Popcorn Ceiling Removal, Popcorn Ceiling Repair, Drywall Repair, and Texture Ceiling and Wall Services since 1987 in the Tampa Bay area of Florida. The owner, Kris Gearty has a team of experienced ceiling professionals to help you with your next ceiling project. We strive to provide the best value and quailty in everything we do, from start to finish. In addition to our popcorn ceiling removal, Popcorn Ceiling Repair, and texture ceiling services, we also offer a full range of painting services. We are experienced in both residential and commercial, which includes interior and exterior painting. We also offer free of charge our professional color selection service.